Every time a new challenge is about to be revealed, I get all excited as well as a little worried, because I always wonder what kind of surprises our hosts have in store for us! One thing I'm sure of is that it will once again be the occasion for me to learn new tricks and push my borders a little further each time. It is for those reasons that the February recipe particularly attracted me. I knew that this month's trial was going to be fun as I love bread and enjoy testing all kinds of new and unknown (to me) baking techniques. Well, I was not going to be disappointed! The word "Bread" rings very poetically in my ears. It evokes wonderful yeasty fragrances, the smooth and elastic inside of a loaf, the thrilling pleasure one gets while watching his/her bread bake, a delightfully crunchy crust that snaps when you bite into it, an incomparable gustatory adventure, the incredible vastness of breadland, the amazing possibilities that baking offers and so much more... So many things that make our daily life all the more enjoyable. Although I have a minuscule kitchen, an itsy-bitsy working space (the sides of my sink) and no special equipment on hand (everything is done by hand and I have a limited amount of kitchen gadgets/ustensiles), this bread turned out smashingly well and looked pretty much like the ones you can find at a bakery. A great fulfillment for a perfectionist like me! I must say that it was time-consuming as it took me a whole day from 11h00 am till around 18h00 pm to finish those three loaves. Yet, at the same time, it wasn't extremely difficult technically speaking. Of course, there were a few tricky moments/parts to go through like the shaping and the transferring from the towel to the baking sheet. Certain stages were a little critical, but otherwise, it was quite a straight-forward and flawless process which demanded a lot of patience and concentration. For me, things went smoothly and I met no problem at all, apart from the post-baking disaster I had to face once the breads were cooling on the rack. I mean, hell! My kitchen looked like a disaster area and the whole place was covered with a layer of flour. A real mess! That "French Bread" was really gorgeous. It looked just perfect, had a shiny and crispy crust and the most beautiful and smooth inside I had ever come across. Taste-wise, it was heavenly. 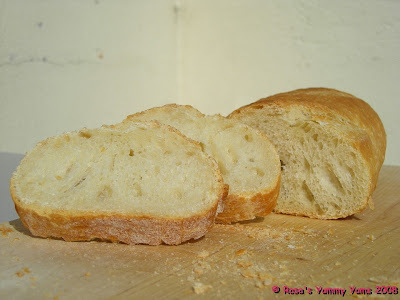 Just with a little butter, this bread tasted awesomely good and was magnificently fragrant! Yummy! Another brilliantly amazing recipe that I will keep preciously! Thanks to both our hosts Breadchick Mary from "The Sour Dough" (USA) and Sara from "I Like To Cook" (USA) for the diverting day I had!!! You made a damn good choice here!!! Recipe taken from "Mastering the Art of French Cooking: Volume Two" by Julia Child and Simone Beck. Unless you plan to go into the more elaborate simulation of a baker’s oven, you need no unusual equipment for the following recipe. Here are the requirements, some of which may sound odd but will explain themselves when you read the recipe. 4 to 5 quart mixing bowl with fairly vertical rather than outward slanting sides. A kneading surface of some sort, 1 1/2 to 2 square feet. A rubber spatula or either a metal scraper or a stiff wide metal spatula. 1 to 2 unwrinkled canvas pastry cloths or stiff linen towels upon which the dough may rise. A stiff piece of cardboard or plywood 18 – 20 inches long and 6 – 8 inches wide, for unmolding dough from canvas to baking sheet. Finely ground cornmeal or pasta pulverized in an electric blender to sprinkle on unmolding. Board so as to prevent dough from sticking. the largest baking sheet that will fit in your oven. A razor blade or extremely sharp knife for slashing the top of the dough. A soft pastry brush or fine spray atomizer for moistening dough before and during baking. A room thermometer to verify rising temperature. 1. Stir the yeast in the 1/3 cup warm water and let liquefy completely while measuring flour into mixing bowl. 2. When yeast has liquefied, pour it into the flour along with the salt and the rest of the water. 3. Stir and cut the liquids into the flour with a rubber spatula, pressing firmly to form a dough and making sure that all the bits of flour and unmassed pieces are gathered in. 4. Turn the dough out onto kneading surface, scraping bowl clean. 5. Let the dough rest for 2 – 3 minutes while you wash and dry the bowl. Start kneading by lifting the near edge of the dough, using a pastry scraper or stiff wide spatula to help you if necessary, and flipping the dough over onto itself. Scrape dough off the surface and slap it down; lift edge and flip it over again, repeating the movement rapidly. 7. (In 2 -3 minutes the dough should have enough body so that you can give it a quick forward push with the heel of your hand as you flip it over.) Continue to knead rapidly and vigorously in this way. (If the dough remains too sticky, knead in a sprinkling of flour. The whole kneading process will take 5 – 10 minutes, depending on how expert you become). Let dough rest for 3 – 4 minutes. Knead by hand for a minute. (The surface should now look smooth; the dough will be less sticky but will still remain soft.) It is now ready for its first rise. Wash and fill the mixing bowl with 10 1/2 cups of tepid water (70 – 80 degrees) and make a mark to indicate that level on the outside of the bowl. 10. Pour out the water, dry the bowl, grease it and place the dough in it. 11. Cover with a greased plastic wrap, and top with a folded towel. Set on a wooden surface, marble or stone are too cold. Or on a folded towel or pillow, and let rise free from drafts anyplace where the temperature is around 70 degrees. 13. Lightly flour the palms of your hands and flatten the dough firmly but not too roughly into a circle, deflating any gas bubbles by pinching them. 14. Lift a corner of the near side and flip it down on the far side. Do the same with the left side, then the right side. Finally, lift the near side and tuck it just under the edge of the far side. 15. Slip the sides of your hands under the dough and return it to the bowl. Cover and let rise again, this time to not quite triple, but again until it is dome shaped and light and spongy when touched. 16. Loosen dough all around inside of bowl and turn out onto a lightly floured surface. 18. After you have cut each piece, lift one end and flip it over onto the opposite end to fold the dough into two; place dough at far side of kneading surface. 19. Cover loosely with a sheet of plastic and let rest for 5 minutes before forming. 20. While the dough is resting, prepare the rising surface; smooth the canvas or linen towel on a large tray or baking sheet, and rub flour thoroughly into the entire surface of the cloth to prevent the dough from sticking. 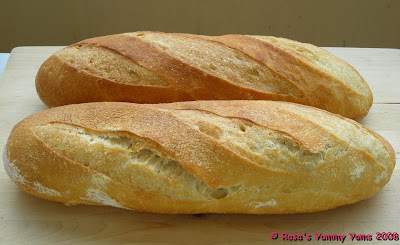 Baguettes are typically much too long for home ovens but the shaping method is the same. I. After the 3 pieces of dough have rested 5 minutes, form one piece at a time, keeping the remaining ones covered. II. Working rapidly, turn the dough upside down on a lightly floured kneading surface and pat it firmly but not too roughly into an 8 to 10 inch oval with the lightly floured palms of your hands. Deflate any gas bubbles in the dough by pinching them. III. Fold the dough in half lengthwise by bringing the far edge down over the near edge. IV. Being sure that the working surface is always lightly floured so the dough will not stick and tear, which would break the lightly coagulated gluten cloak that is being formed, seal the edges of the dough together, your hands extended, thumbs out at right angles and touching. V. Roll the dough a quarter turn forward so the seal is on top. VII. Flatten the dough again into an oval with the palms of your hands. VIII. Press a trench along the central length of the oval with the side of one hand. IX. Fold in half again lengthwise. X. This time seal the edges together with the heel of one hand, and roll the dough a quarter of a turn toward you so the seal is on the bottom. XI. Now, by rolling the dough back and forth with the palms of your hands, you will lengthen it into a sausage shape. Start in the middle, placing your right palm on the dough, and your left palm on top of your right hand. XII. Roll the dough forward and backward rapidly, gradually sliding your hands towards the two ends as the dough lengthens. XIII. Deflate any gas blisters on the surface by pinching them. Repeat the rolling movement rapidly several times until the dough is 16 inches long, or whatever length will fit on your baking sheet. During the extension rolls, keep circumference of dough as even as possible and try to start each roll with the sealed side of the dough down, twisting the rope of dough to straighten the line of seal as necessary. If seal disappears, as it sometimes does with all purpose flour, do not worry. XIV. Place the shaped piece of dough, sealed side up, at one end of the flour rubbed canvas, leaving a free end of canvas 3 to 4 inches wide. The top will crust slightly as the dough rises; it is turned over for baking so the soft, smooth underside will be uppermost. XV. Pinch a ridge 2 1/2 to 3 inches high in the canvas to make a trough, and a place for the next piece. Cover dough with plastic while you are forming the rest of the loaves. XVI. After all the pieces of dough are in place, brace the two sides of the canvas with long rolling pins, baking sheets or books, if the dough seems very soft and wants to spread out. Cover the dough loosely with flour rubbed dish towel or canvas, and a sheet of plastic. Proceed immediately to the final rising, next step. Follow the steps above but making thinner sausage shapes about 1/2 inch in diameter. When they have risen, slash as with the Batard. 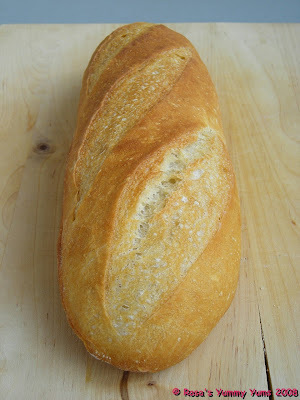 Form like batards, but you will probably not have to lengthen them at all after the two foldings and sealings. Place rolls on a floured canvas about 2 – 4” apart and cover with plastic to rise. When they have risen, make either 2 parallel slashes or a single slash going from one end to the other. The object here is to force the cloak of coagulated gluten to hold the ball of dough in shape: the first movement will make cushion; the second will seal and round the ball, establishing surface tension. I. Place the dough on a lightly floured surface. II. Lift the left side of the dough with the side of your left hand and bring it down almost to the right side. III. Scoop up the right side and push it back almost to the left side. Turn the dough a quarter turn clockwise and repeat the movement 8 – 10 times. The movement gradually smooths the bottom of the dough and establishes the necessary surface tension; think of the surface of the dough as if it were a fine sheet of rubber you were stretching in every direction. IV. Turn the dough smooth side up and begin rotating it between the palms of your hands, tucking a bit of the dough under the ball as you rotate it. In a dozen turns you should have a neatly shaped ball with a little pucker of dough, le cle, underneath where all the edges have joined together. V. Place the dough pucker side up in a flour-rubbed canvas; seal the pucker by pinching with your fingers. Flour lightly, cover loosely and let rise to almost triple its size. After unmolding upside down on the baking sheet, slash with either a long central slash, two long central slashes that cross at right angles, or a semi-circular slash around half the circumference. The principles are the same here as for the preceding round loaves, but make the cushion shape with your fingers rather than the palms of your hands. II. Place the formed ball of dough pucker side up on the flour rubbed canvas and cover loosely while forming the rest. Space the balls 2 inches apart. When risen to almost triple its size, lift gently with lightly floured fingers and place pucker side down on baking sheet. Rolls are usually too small for a cross so make either one central slash or the semi-circular cut. Follow the directions for the round loaves except instead of rotating between the balms of your hands and tucking to form a round loaf, continue to turn the dough from the right to the left, tucking a bit of each end under the oblong loaf. In a dozen turns you should have a neatly shaped oval with tow little puckers of dough, le cles, underneath where all the edges of have joined together. I. Place the dough pucker sides up in a flour-rubbed canvas; seal the puckers by pinching with your fingers. Flour lightly, cover loosely and let rise to almost triple its size. After unmolding upside down on the baking sheet, slash with parallel slashes going diagonally across the top starting from the upper left and going to the lower right. Gently dislodge dough onto baking sheet, keeping same side of the dough uppermost: this is the soft smooth side, which was underneath while dough rose on canvas. If necessary run sides of hands lightly down the length of the dough to straighten it. Unmold the next piece of dough the same way, placing it to the left of the first, leaving a 3 inch space. Unmold the final piece near the left side of the sheet. Start the cut at the middle of the blade, drawing toward you in a swift clean sweep. 26. As soon as the dough has been slashed, moisten the surface either by painting with a soft brush dipped in cold water, or with a fine spray atomizer, and slide the baking sheet onto rack in upper third of preheated oven. Rapidly paint or spray dough with cold water after 3 minutes, again in 3 minutes, and a final time 3 minutes later. 29. 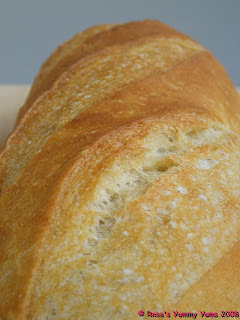 Cool the bread on a rack or set it upright in a basket or large bowl so that air can circulate freely around each piece. 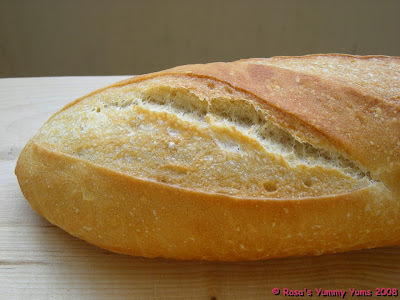 Eat this bread with cheese, pate, dried meat/sausages, savory and sweet spreads or alongside a bowl of soup. Use it to make toasts, bruschette, bread pudding or sandwiches. Etant donné la longueur du texte original, je n'ai malheureusement pas pu faire une traduction française de ce billet et je m'en excuse auprès de tous mes amis blogueurs francophones!!! Your bread looks amazing, well done! These look right out of a bakery. So beautiful! Tes petits pains sont superbes, je ne comprends pas tout le message anglais, mais je vais regarder en quoi consiste les "DARING BAKERS", cela m'intéresse. Déjà avec la tarte au citron meringuée. Gosh! yours look so fresh and crispy on the outside. I love it. Mine was a bit burned! lol! i have no other word but beautiful!!! great job on this month's challenge!! Zorra is right, I think the DB's should open a French Bakery. You did a great job. Wow, pas mal du tout! Just perfect! I about to have lunch and I'd love to have one of your rolls. Mine is still cooling down so I can't touch that one...yet! malheureusement je n'ai pas pu lire l'article..(no anglais), mais les photos sont tellement belles..uauu,quel beau pain! Oh Rosa, your loaf is just perfect ! beautiful job! that crust is perfect. That is the most beautiful looking bread, very professional. Truly YUM. Le résultat est superbe, tant la mie que la croute, une vraie pro ! Great job on your bread!! They look amazing and perfect! 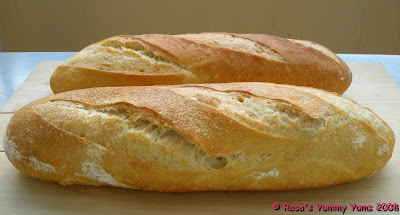 tu as super bien boulangé rosa :) elles sont superbes tes baguettes ! The bread is beautiful. It has a wonderful crust and crumb. You did a wonderful job! Your bread is beautiful, mine did not have that rich color. Great job! Waouhhh il sont parfaits tes pains !Bravo ! Wow! I will never get over your baking skills, frankly. Great job as usual Rosa! Super réussi ce pain à la française.. Je te souhaite aussi un bon w-end ! wow! your bread looks fantastic Rosa!!! The crust looks crisp and thin and ... miam! rosa, it looks just perfect! your bread came out smashingly well, indeed!Great job! Rosa, your bread looks fantastic! I've got a craving for it again now. :) This challenge was a great learning experience for me, too. Lovely job! Your bread is so beautiful! It looks like you bought it at a wonderful bakery. Well done! Wow, could you come teach me how to slash! Your loaves are perfect and so is your crumb! Gorgeous! There is a lot of love in these loaves--like some have already said, they look professional! Beautiful work as usual. Your loaves are beautiful-- so golden! This was a fun challenge, wasn't it? Les photos sont très jolies et donnent envie de la faire soi meme, merci pour le lien en français. bon week end. ooh..your bread looks absolutely delicious!! great job! Wow! a full day to make the bread. What a challenge. Looks like it came from a local bakery. Good work. Je suis allée sur le site la casserole carrée et j'ai pu lire cette recette de pain. Il faut avoir du temps mais le résultat en vaut la peine. Tes baguettes sont superbes. Bravo Rosa. 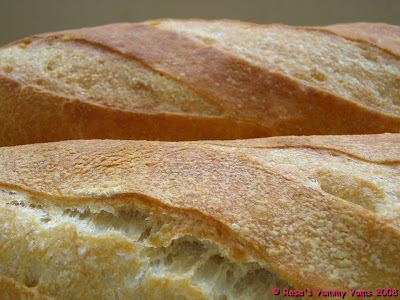 You loaves are absolutely gorgeous, as though they came from the best boulangerie in town! Very impressive! LOOK at your bread! That's very near to perfection, isn't it. Great! These look so good! Crispy on the outside and airy and light on the inside - yum! Rosa, I have finally made it over to your blog and ARTISAN is the word here. Your breads are works of art! Perfect. Excellent. Hi Rosa, my name is Danielle and I´m also in the challenge (DARING BAKERS). 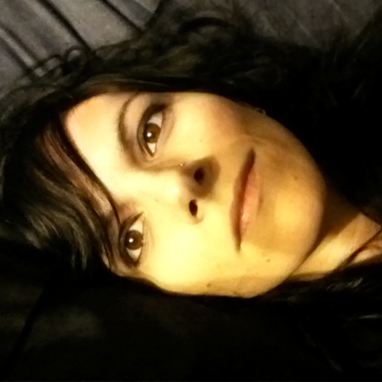 I´m moving to Lausanne next month. It´s very good to know tha sombary from switzerland is in the challenge!!! You never seize to amaze me Rosa. I will leave this one to you. I'm still having issues with my stove and have begun turning it down 25 degrees again. At any rate, the loaves look as beautiful as they are delicious, I am sure. AHHH! THAT'S the crust I wanted! I can't believe you did it all by hand and came up with such great results. I need your crust secrets! Tres Bien Rosa. I knew you would master this! And that is the whole point, Rosa, to learn! But you are so good at baking bread, you could teach us! Rosa, I am with you, Zorra and Ulrike, let's open a bakery! Your bread is so perfect in look and crumb. Thanks so much for joining Sara and I on this challenge. I always enjoy visiting with you and especially enjoyed baking with you this month. your bread looks like it's burdsting with goodness and oozing with flavor. they are the plumpest ones i've seen! ta baguette est magnifique! un défi relevé de très belle manière! bravo rosa, je suis admirative! Je suis toujours en admiration devant tes pains. Tu es vraiment douée. Tes baguettes ont l'air de sortir de la boulangerie. Ils sont superbes tes pains rosa ! Comme elle belle ta baguette!!! 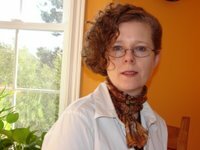 Merci pour ton commentaire à mon site. Moi, je n'ai jamais visité ton pays, mais c'est un voyage que j'aimerais beaucoup faire. 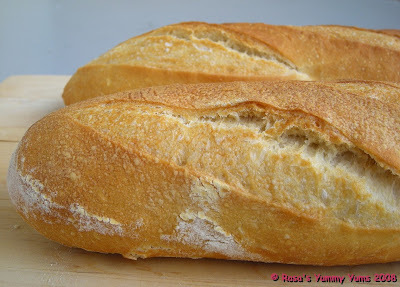 Rosa, what beautiful loaves of french bread. Isn't it amazing that simple loaves of bread can cause such a flour tornado in our kitchens? Great job with this months challenge! Jamais je n'arriverai à faire d'aussi jolies baguettes ! Bravo. 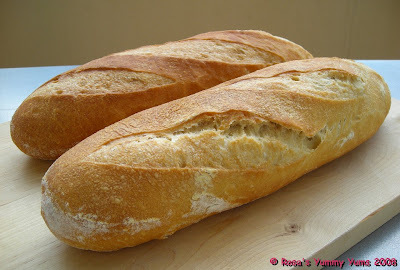 Rosa, your baguettes are so beautiful! Even though this was just my second DB challenge, I feel exactly like you: always so educative and challenging! Great job. Un vrai bon pain français.......tes baguettes sont parfaitement réussies et très appétissantes. Bravo ! Je suis admirative devant d'aussi belles baguettes, bravo ! 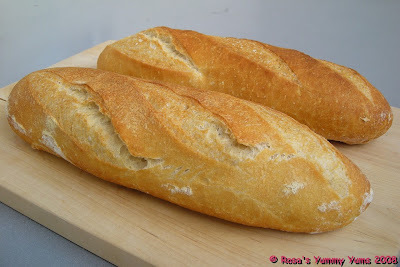 Tes baguettes sont magnifiques, on dirait qu'elles viennent tout droit de la boulangerie!! With such a wonderful success, I'm sure you'll be doing it again sometime. Worth the time and the flour all over the kitchen? You bet! Il manque juste l'odeur du pain frais mais on l'imagine ! J'ai pu lire le texte, même en anglais... Quel boulot!, le résultat est génial!! What fantastic looking bread you have! Oh my, it's just lovely. 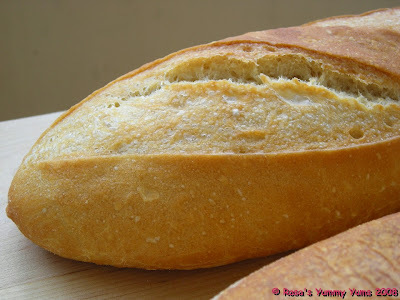 Rosa, I fell in love with your loaves, the day you posted it on the private blog. The crust looks marvelous. Hébien quelle réussite ! Je n'en ai encore jamais réalisé, mais je t'avoue que tes photos donnent envie. wow rosa, how beautiful! 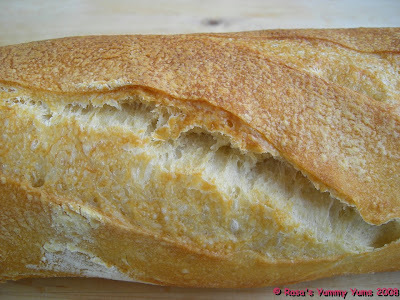 oooh, i havent eaten bread since new years day - this must have been so good with butter right out of the oven -- drooool! Absolument magnifiques ces petits pains français ! Et quelle recette ! Franchement, moi qui suis passionnée de boulange, je peux te dire qu'on les croirait sortis d'une de nos boulangeries ! La mie est aérée, ils ont une jolie croute, ils sont fendus comme il faut, bref ils sont parfaits ! Je t'applaudis et je crie : BRAVO! Baking perfection = Rosa. 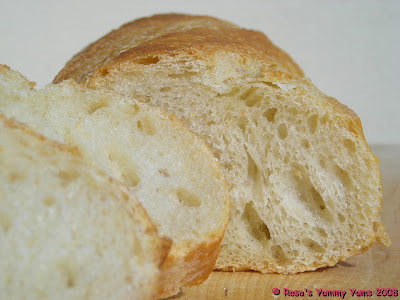 I am bookmarking your post and you provide some indepth and valuable info on making this bread. Thank you. Your bread is some of the most perfect I've seen yet! Wonderful! Rosa, I knew your bread would be so beautiful--and it is! I love the photos, it makes me feel like I'm in a bakery with fresh, hot bread coming out of the oven! Ils sont très réussis !!!! J'aime beaucoup les photos qui me donne faim. 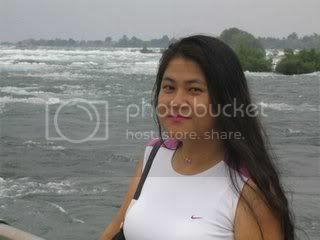 WAOW Rosa!! Quel billet!!! Et quelles belles baguettes!! Quand ouvres-tu ta propre boulangerie??? Simply beautiful! It looks exactly the same as in a French bakery! 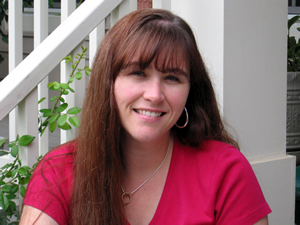 Thanks for commenting on my new blog look. I really like it. Have a good day. are you sure these are store bought ??? hahaha just joking :p they look so fantastic and rather so perfect I'm amazed. Well done u !!! and wow i must say what a long and compressive post. and surely ne of your best. No one can go wrong with such precise instructions. Whoa! You did it again and it is always a drooling challenge for me when I see bread on your blog...yummy! Je rêve ! Tous ces billets quand je n'en ai posté qu'un seul !! Ces baguettes ma rappellent mon enfance parisienne et le bonheur du petits déjeuner avec un bon beurre normand !! Je suis toujours en admiration devant tes pains! Ces baguettes sont magnifiques et me donnent faim! That's a beautiful baguette Rosa! Fantastic job! Superbes !!!! Les explications sont très claires et précises ! Tes photos sont très belles, quel dommage que je ne comprenne pas l'anglais ! Wow! Your bread looks like ones you get from an artisan bakery! Your work is perfection. It looks amazing! Superbe travail, et pour un résultat qui ne l'est pas moins! Je suis dans une période boulange intensive en ce moment, je vais faire l'effort de te lire in extenso en anglais! Vraiment très réussi tes baguettes! C,est quoi ton secret? Aujourd'hui,je viens juste de râter une recette de buchteln.La pâte n'a pas levé,je crois que mon lait était trop chaud. Encore une fois bravo pour ton magnifique pain. Tu devais etre tres fiere Rosa! Comme quoi, faire du pain demande peu d'ingredients et peu d'ustensiles aussi. En revanche beaucoup de passion et de patience; de ce cote, tu as tout ce qu'il faut ! your Pain Français looks perfect !! I'll come later to watch and read more ! I know exactly what you mean about that feeling you get right before the hostess of the month lets the rest of us in on the challenge recipe! hahahaaa! Je t'ai déjà laissé un commentaire concernant cette merveille mais j'ai vraiment besoin d'explications concernant ce "Daring Bakers" car, même en allant sur leur site, je ne comprends toujours pas. Devez-vous tous faire la même recette? Tout ça n'est pas très clair. Merci Rosa pour tout ce que tu nous fais connaître. wouw sublime je nai pas de mot! Gorgeous! As if they come from a boulangerie! Thanks for the recipe.